246 pages | 15 B/W Illus. This volume is published in honour of the acclaimed work of Robert Holland, historian of the British Empire and the Mediterranean, and it brings together essays based on the original research of his colleagues, former students and friends. The focal theme is modern Cyprus, on which much of Robert Holland’s own history writing was concentrated for many years. The essays analyse British rule in Cyprus between 1878 and 1960, and especially the transition to independence; the coverage, however, also incorporates the post-colonial era and the construction of present-day dilemmas. The Cypriot experience intertwines with Anglo-Hellenic relations generally, so that a section of the book is devoted to those aspects that have been central to Robert Holland’s sustained contribution. The essays explore, inter alia, historiography, social history, economics, politics, ideology, education and the 2013 financial crisis. 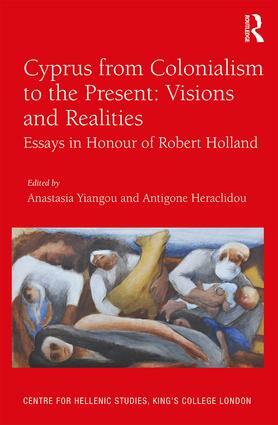 Taken as a collection the essays serve as an appropriate tribute to Robert Holland as well as an innovative addition to the existing historiography of colonial and post-colonial Cyprus. They will be of great interest to anyone interested in Imperial and Commonwealth History, Anglo-Hellenic relations and the Eastern Mediterranean in the nineteenth and twentieth centuries. Anastasia Yiangou specializes in the history of British rule in Cyprus. She is the author of Cyprus in World War II: Politics and Conflict in the Eastern Mediterranean (2010) and the co-editor of The Greeks and the British in the Levant, 1800-1960s: Between Empires and Nations (2016). Antigone Heraclidou is affiliated to the Open University of Cyprus where she lectures modern history of Cyprus. In May 2012, she was awarded a PhD in History from the Institute of Commonwealth Studies. A revised version of her thesis was published in 2017 under the title Imperial Control in Cyprus: Education and Political Manipulation in the British Empire.